7.37am. An alarm clock blares, a family stirs. It’s the start of another day, in which children complain about their burnt porridge before being packed off to school and work. For this family though, this particular day is going to be anything but normal. This is the day their son dies, stabbed to death. 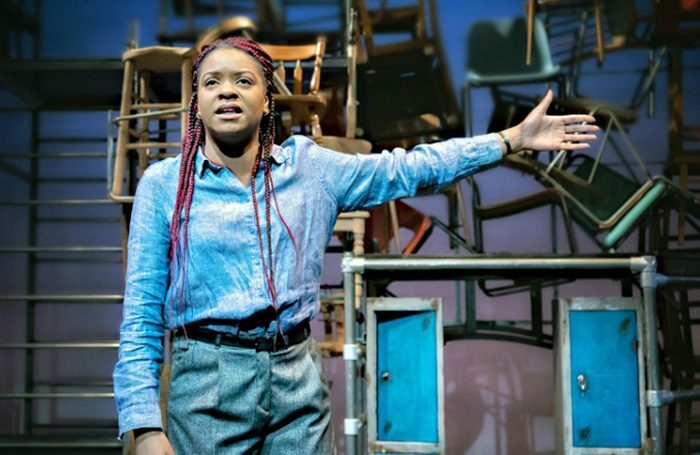 Debbie Tucker Green’s Random was originally staged at the Royal Court in 2008. It has lost none of its power over the last decade. This is not a polemic about knife violence, rather an exploration of one family’s grief. For the first 20 or so minutes, the play paints a picture of domestic normality. The writing during these passages has a poetic, lilting quality to it. But when the play shifts gear, it becomes something truly remarkable. Random was written for a solo performer and Kiza Deen is extraordinary in Gbolahan Obisesan’s revival, fluidly moving between four different characters. Her performance is as powerful as the words. Whether playing a swaggering schoolboy or a sister in mourning, she’s utterly convincing. Her encapsulation of someone consumed by grief, walking around in front of Max Johns’ set of upturned chairs, desperately trying to make sense of the horrific events that have befallen her family, is heartbreaking. It’s the little things that upend you – the moment when she tries to catch one last whiff of her brother’s scent, or sees his computer left on standby, never to be used again. At just under an hour, Random is a short piece, but one of considerable power. The impact of this moving visceral monologue lingers long after the lights go up.